Andrew Beasley is a London based photographer with over 10 years of professional experience specialising in presenting interior spaces and architecture resulting in his work being published internationally in books and design press. With a technical yet creative approach, he provides high quality and vibrant images to all aspects of the design industry in both commercial and residential sectors. 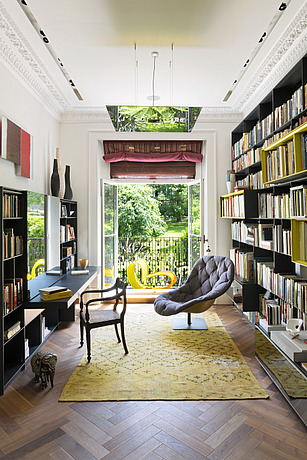 For his profile shot, Andrew chose his picture of the library area on the raised ground floor of an elegant house in Notting Hill, west London, over-looking a private garden, which was designed by Crawford & Gray architects: "I chose this image for a number of reasons. Firstly the room itself has beautiful proportions and original detailing and views to the sunny private garden. This room has been skilfully created combining vibrant colours, a mix of textures and prints and a contemporary selection of designer furniture."